It was billed as the day's big clash but it was over within 19 minutes. At that point, Manchester City were three goals up on Chelsea, thanks to Raheem Sterling and a brace from Sergio Aguero. And it was 4-0 just six minutes later as City put on a show. The home side didn't relent after the break, Aguero getting his hat-trick from the penalty spot and Sterling a second, and the final score of 6-0 was completely deserved as Maurizio Sarri's side put in an awful display. That incredible scoreline was backed at [250.0] on the Betfair Exchange. Pep Guardiola' side are hitting form at the right time and are now [1.76] to win the title on the Betfair Exchange, having been out to even money before the game. Liverpool are level on points but behind on goal difference and can be backed at [2.56]. Spurs, winners of the early kick-off, trail the leading pair by five points and can be backed at [26.0]. The chastening defeat ratchets up the pressure on Chelsea manager Sarri who is now just 2/1 to be the next Premier League manager out of a job. That's the same price as Marco Silva and a point longer than Claude Puel. The Betfair Sportsbook is offering a market on next permanent Chelsea manager with Frank Lampard and Diego Simeone the 5/1 favourites, Luis Enrique is next man up at 6/1 while Max Allegri and Zinedine Zidane can be backed at 7/1. Brendan Rodgers at 8/1 is the only other candidate who can be backed in single figure odds. Defeat also leaves Chelsea one point behind Manchester United in the battle to finish in the top four. United are [2.0] and Chelsea [2.2] to secure a Champions League place at the end of the season. These two sides meet again at Wembley in a fortnight in the Carabao Cup Final. City are [1.43] to lift the fourth trophy of Pep Guardiola's reign at the club. 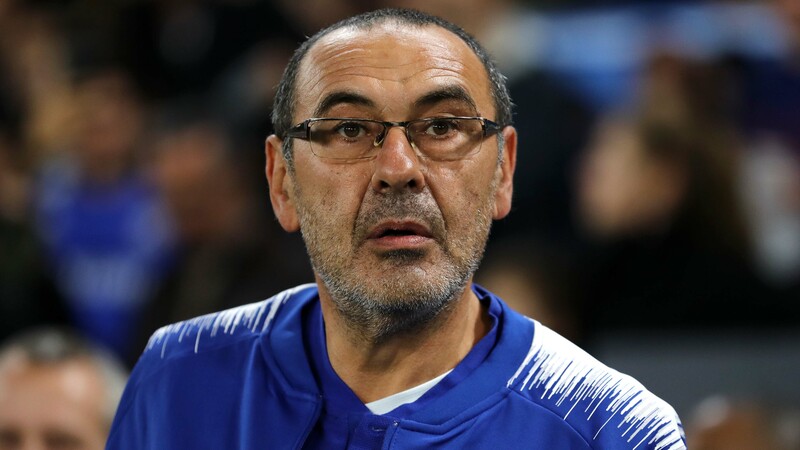 Chelsea are [3.15] but will Sarri be the man in the Blues' Wembley dugout? Spurs stayed in the title picture but they had to work very hard against a Leicester side that was unlucky not to take something from the game. A scoreline of 3-1 flattered a Spurs side that has carved out a happy knack of getting results when their performances have not been top-class in recent weeks. Defender Davinson Sanchez was the unlikely first goalscorer, nodding home from close range to take Spurs into the first-half lead. The drama came after the break, however. An evenly-matched contest looked sure to go level when the visitors were awarded a spot kick on the hour. Jamie Vardy, who started the game on the subs' bench, was introduced to take the penalty but put his shot too close to Hugo Lloris. And the former England forward's frustration was compounded when Christian Eriksen scored from outside the box just three minutes later. That should have been the point at which Spurs cruised to safety but Vardy atoned for his sins, scoring with 15 minutes left to set up a nervy finish. Leicester carved out chances but couldn't make any stick and it was Spurs who scored the game's fourth goal when Heung-min Son scored on the break very late on.